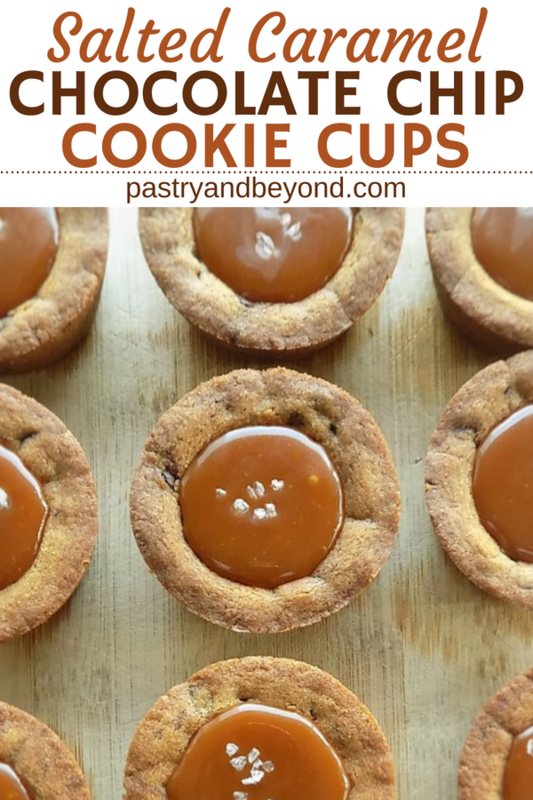 These chocolate chip cookie cups are filled with my smooth homemade caramel sauce. I sprinkle sea salt on top which balances the sweetness. 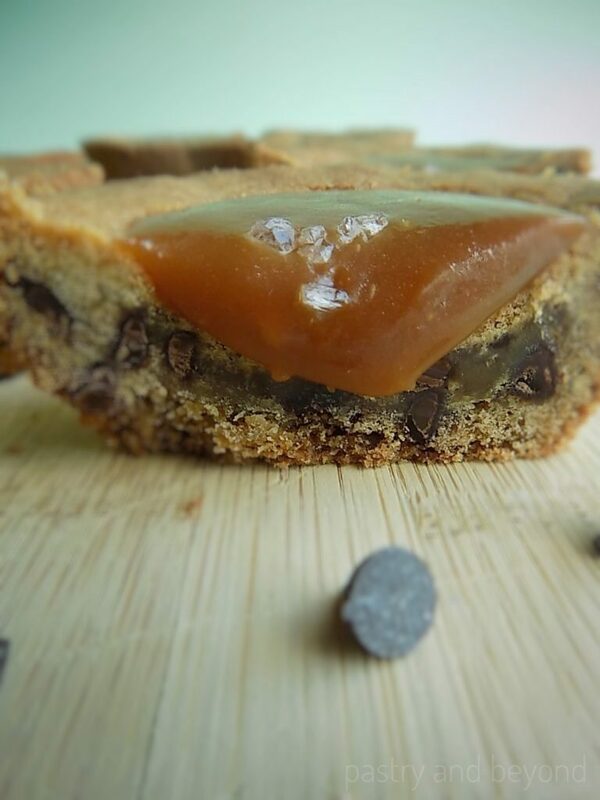 I was thinking of making chocolate chip cookie bars with my homemade caramel sauce. 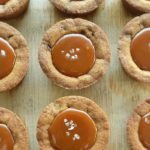 Then I changed my mind; I made cookie cups and filled them with my caramel sauce. I sprinkled some sea salt on top. They were delicious. If you still haven’t tried my homemade caramel sauce, you should! It is very easy to make. With 2 ingredients your sauce will be ready. You should be careful and fast at the same time when making the caramel sauce. First, you need to melt the sugar. When it is time to add the heavy cream, you should add it immediately so the sugar won’t harden and you can start stirring until you have a smooth sauce. It takes only 10 minutes to have that smooth and silky caramel sauce. As caramel is very sweet, I decreased the sugar amount of the chocolate chip cookies. I use 50 grams (1/4 cup) less sugar. Although I decreased the sugar amount, my cookie cups were still slightly chewy. They were delicious with my homemade caramel sauce. Sea salt balanced the sweetness perfectly. Then I make the dough. I place the butter in the bowl of my stand mixer fitted with the paddle attachment and beat until it is soft for almost 2 minutes. Then I add the brown sugar and white sugar, cream them until light and fluffy. Later I add the egg and vanilla. I mix until totally combined. After that, I add the flour in 2-3 batches and mix until totally incorporated. I always scrape down the sides and bottom of the bowl as needed during these steps. 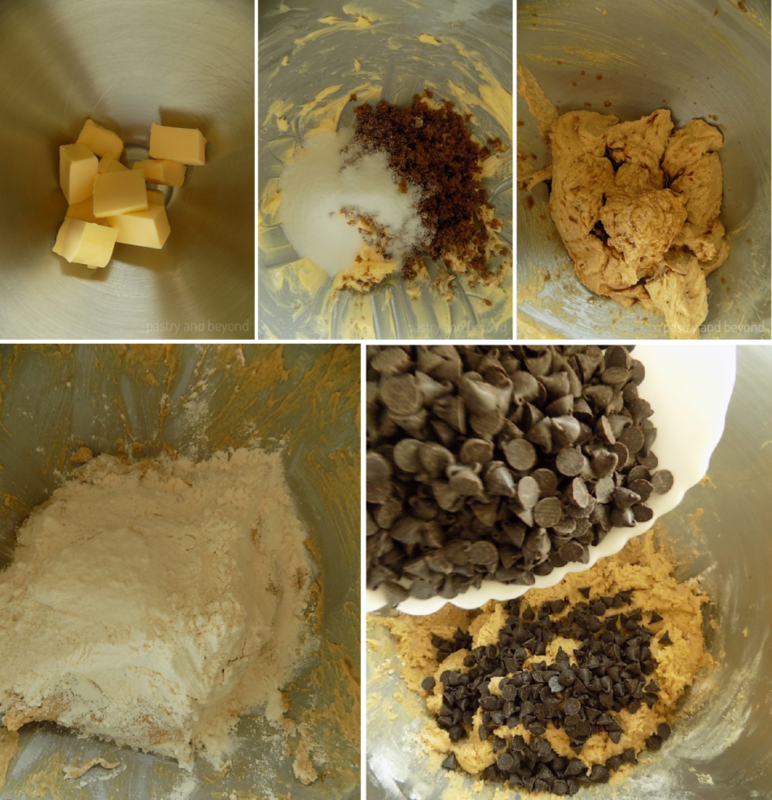 Finally, I add the chocolate chips and mix for 3-4 seconds. After the dough is ready, I divide it into equally 15 pieces(55grams). First, I roll them into balls. Then I place the balls in a cupcake pan and press the balls onto bottom and up sides to give a cup shape with my fingers. I bake them for 12 minutes until they are lightly golden brown. The cookie cups are puffed when they are out of the oven. Using the back of a measuring spoon, I gently press the center to give their cup shape again. I let the cookie cups cool in the pan for 10 minutes. Then I gently remove the cookie cups with a toothpick. Next, I fill the cups with almost 1 tablespoon of homemade caramel sauce. Then I sprinkle coarse sea salt on top. I keep them in the fridge until caramel is thick enough. That’s all! 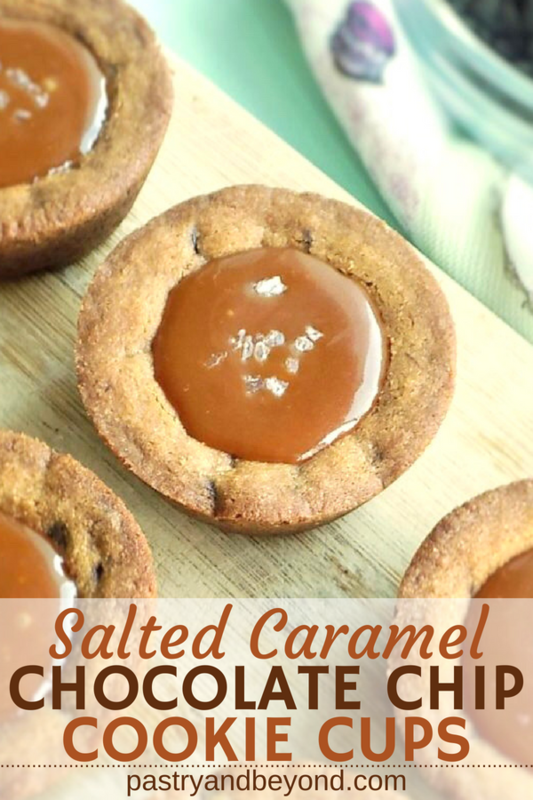 Enjoy these yummy salted caramel filled chocolate chip cookie cups! YOU CAN CLICK HERE OR HERE AND SAVE THIS RECIPE TO YOUR PINTEREST BOARD! 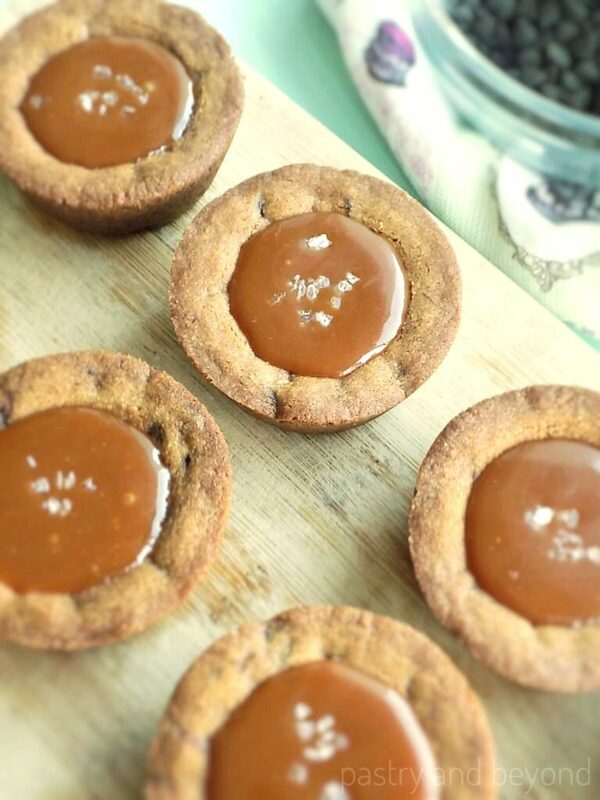 These chocolate chip cookie cups are filled with my homemade caramel sauce. I sprinkle sea salt on top which balances the sweetness. Prepare the caramel sauce. Set aside to cool. Combine flour, baking soda, salt and cornstarch in a medium bowl and set aside. Place the butter in a large bowl and beat on medium speed for 1 to 2 minutes until it is soft with a hand-held mixer or with paddle attachment if using a stand-mixer. Add the brown and white sugar and cream on medium speed until light and fluffy. Add the egg and vanilla, mix well. Add flour mixture in 2-3 batches until it is totally incorporated. During these steps, stop the machine and scrape down the sides and bottom of the bowl with rubber spatula as needed to be sure they are all mixed. Stir in the chocolate chips, mix for 3-4 seconds until evenly incorporated. Divide the dough into equally 15 pieces(55grams). Roll them into balls. Place them into the cupcake pan. Press the balls onto bottom and up sides to give a cup shape with your fingers. Bake for 12 minutes until they are lightly golden brown. The dough will be puffed when they are out of the oven. Using the back of a measuring spoon, gently press the center to give its cup shape again. Let the cookie cups cool in the pan for 10 minutes. Gently remove the cookie cups with a toothpick. 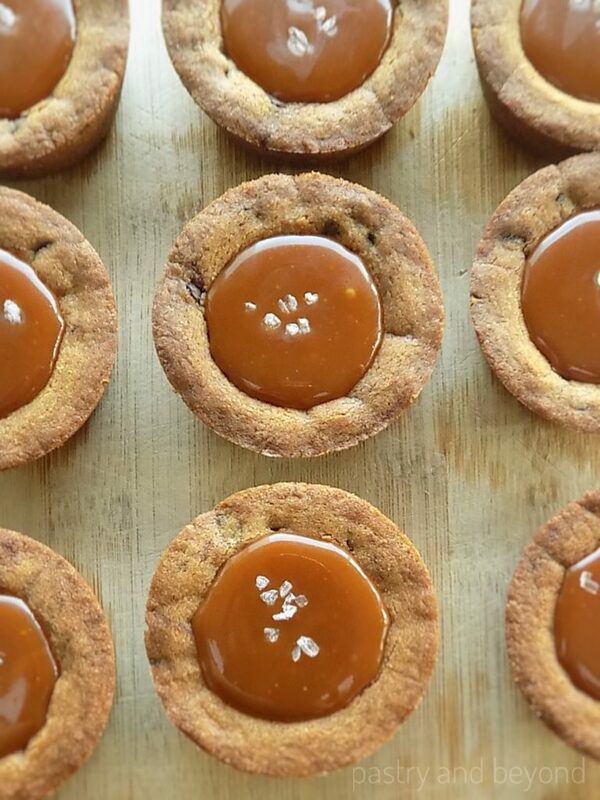 Fill each cookie cups with almost 1 tablespoon of caramel sauce. Sprinkle almost a pinch of coarse sea salt on top. Keep them in the fridge until caramel is thick enough. *You can make your caramel sauce using dry or wet method. These look heavenly! Cannot wait to try. And caramel with a touch of salt- oh goodness yum! I adore salted caramel! These look amazing! 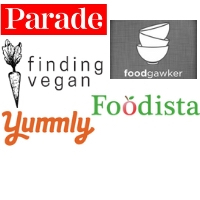 So much deliciousness in these tasty treats. I just know they would be a huge hit here. Wow, these little cookie cups look just amazing, and I’m seriously craving! These little cookie cups are the cutest! And how yummy is that gorgeous caramel! Oh man, I can practically taste it with those little flakes of salt on top. Great recipe idea! Thank you, Amy! I love this yummy caramel sauce-only 2 ingredients! What a super recipe idea! They look so tasty, perfect with a cuppa! Oh my these cups look yummy! These could be dangerous. I might not be able to stop after one or two. Hi Loretta! Yes, these cookies freeze well in an airtight container up to 3 months. You can store the caramel sauce in the fridge up to 14 days.